Neither knows where it is, though there is a suggestion that it is at Patricroft. Wherever, it does not tell us much about the place, but it might provoke a discussion about GWR locos working on to ex-LNW sheds. 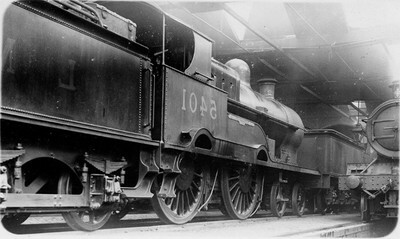 The part-visible loco on the left is a GWR '43XX' class 2-6-0. I can�t think of anywhere but Patricroft where a GWR loco might be found in an LNWR shed. The engine may be due to work the 10.15 GWR express goods from Ordsall Lane to Chester, or the 10/35 GWR express goods from Patricroft to Chester. I can only suggest the obvious: Crewe South, Birkenhead or Shrewsbury, but the roof doesn't look right for any of them! Patricroft is a possibility but I can't locate a post-grouping picture of the shed. Having said that GW moguls regularly worked through to Manchester Exchange from Chester. At both Birkenhead and Shrewsbury the LNWR and GWR sheds were side-by-side but the engines did not intermingle. The GWR shed at Crewe was Gresty Lane. George the Fifth no. 5401 was so numbered in 1927 and was withdrawn in 1936, so photo was taken between 1927 and 1936. Patricroft had two sheds, the Old and the New. The New was remodelled in 1934/5 and the Old was similarly treated in early BR days. So the chances are it is Patricroft, but it is likely there are no other inside photos, which can confirm or deny that fact, and unfortunately, we are now getting too far away for anyone to remember inside either shed before their respective re-buildings.